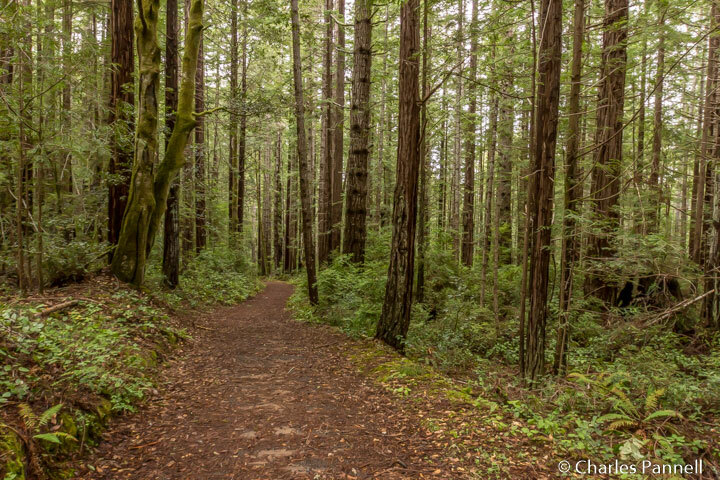 With an average rainfall of over 50 inches per year, Mendocino County is blessed with a lush landscape filled with redwood forests, fern covered canyons and colorful rhododendrons, fuchsias and azaleas. 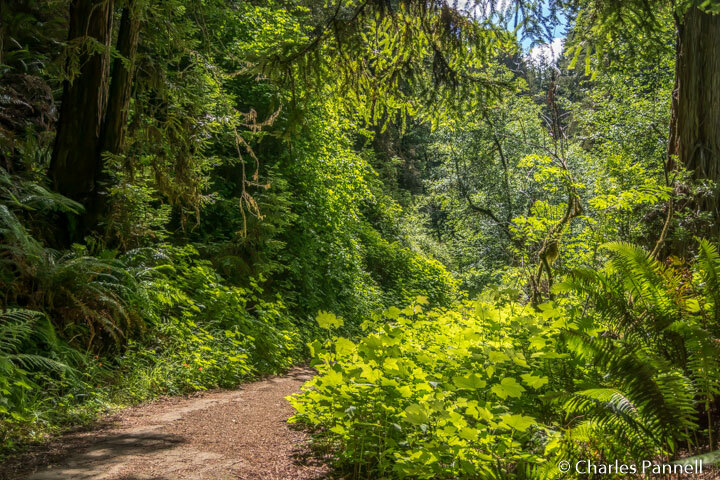 So it comes as no great surprise that this scenic county also boasts two verdant trails that bear the same name — Fern Canyon Trail. Located just five minutes from one another in this secluded slice of Northern California real estate, both trails offer a welcome respite from the hot summer sun. And although neither trail is technically rated as accessible, portions of both of them may be doable for wheelchair-users and slow walkers. Fern Canyon Trail number one is located in the remote southeastern section of Van Damme State Park (www.parks.ca.gov/?page_id=433), about three miles south of Mendocino village. 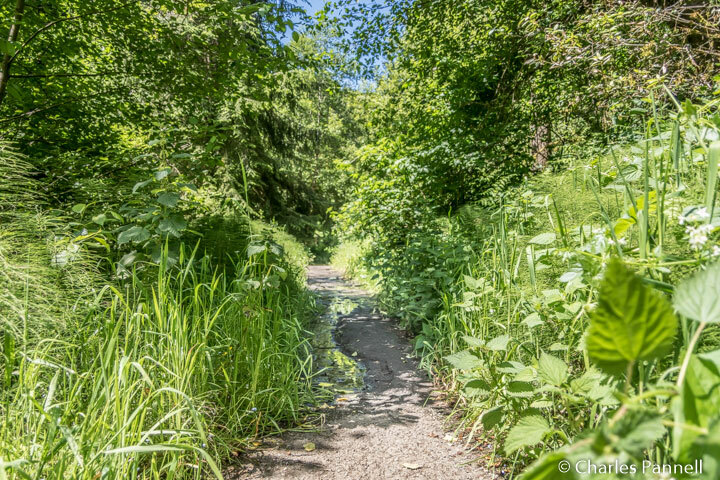 Technically the name of the semi-accessible section of the trail is the Fern Canyon Loop, but since it’s also part of the longer Fern Canyon Trail, it still counts as a duplicate trail name. As an added bonus, the trailhead is right next to the nicely accessible Pygmy Forest Boardwalk. The small parking area is easy to miss though, as it’s tucked away off Airport Road just east of Albion Little River Road. 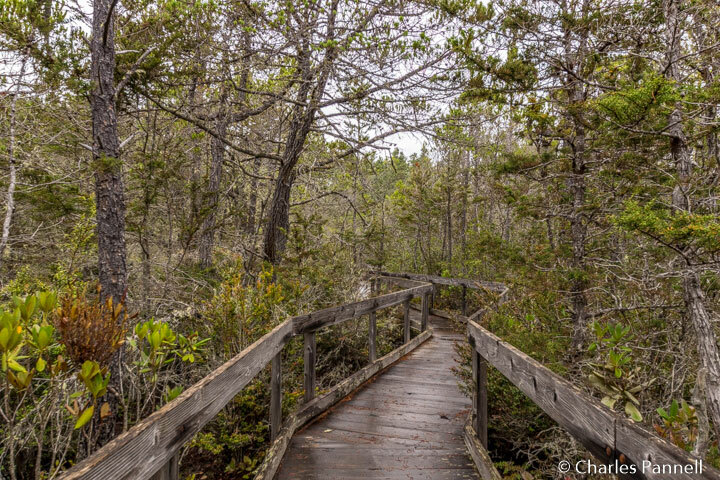 Accessible parking is located next to the Pygmy Forest Boardwalk, with level access over to the 300-yard loop trail. The pleasant boardwalk winds around the dwarf forest filled with rhododendrons, huckleberry bushes, pine trees and manzanita. Interpretive exhibits detail the evolution of this chunk of land and explain the reasons for the stunted growth of the plants and shrubs. About halfway along the boardwalk, there’s a ramp out to an old logging road. 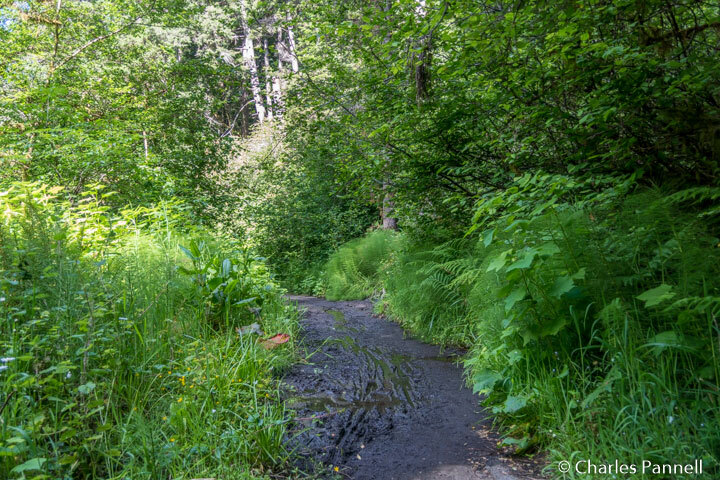 The left branch of the road leads back to the parking lot, but if you turn right you’ll end up at the Fern Canyon Loop trailhead. The logging road is doable in dry weather, and although there are some patches of gravel and a few ruts, they are easy to dodge. Once you reach the trailhead of the 1.2-mile loop trail, proceed clockwise, as there are some obstructions in the counterclockwise direction. The trail winds along a fern-lined hillside, and heads slightly downhill at first; but after a half-mile it becomes too steep for most wheelchair-users and slow walkers. Be sure and keep an eye on the grade as you descend, as it’s easy to be distracted by the scenery and then end up unable to make it back uphill. It’s also important to note that there are no restrooms in this area of the park, so plan ahead. There also aren’t any picnic tables, but there are a few wide level spaces near logs along the trail. And if that’s a bit too rustic for you, there are also some benches along the boardwalk. The other Fern Canyon Trail is located in Russian Gulch State Park (www.parks.ca.gov/?page_id=432), which is two miles north of Mendocino on scenic Highway 1. There’s accessible parking at the trailhead, but if the campground is closed, the road to the trailhead is barricaded. During those times, you’ll have park near the campground entrance and hoof it about a half-mile to the trailhead. On the plus side, it’s a level paved road, so it’s easy to navigate; however some wheelchair-users may require a bit of assistance to get around the barricade. An accessible restroom is located across from campsite 21; however it’s locked in the off season. There’s also a picnic table near the water tank at the beginning of the trail, and although it’s not technically accessible, it is on level ground and mostly usable. Although the trail looks a little ominous at the beginning, if you can make it past the first patch of mud you’re good to go. 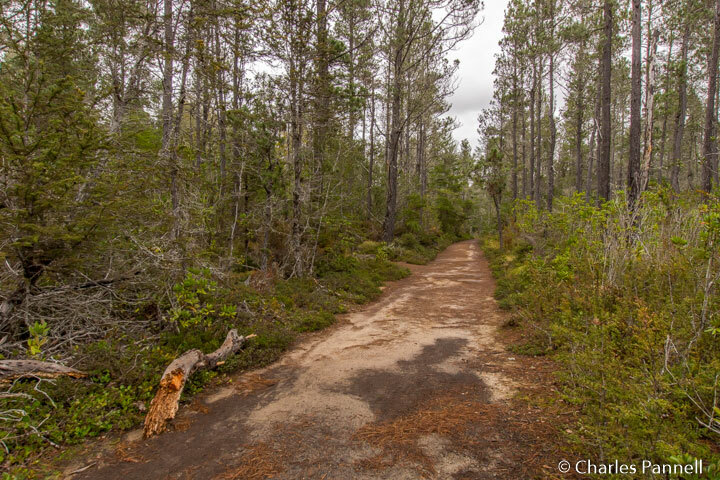 This former logging road begins as a six-foot wide mostly asphalt trail, which later gives way to a narrower three-foot wide dirt trail. 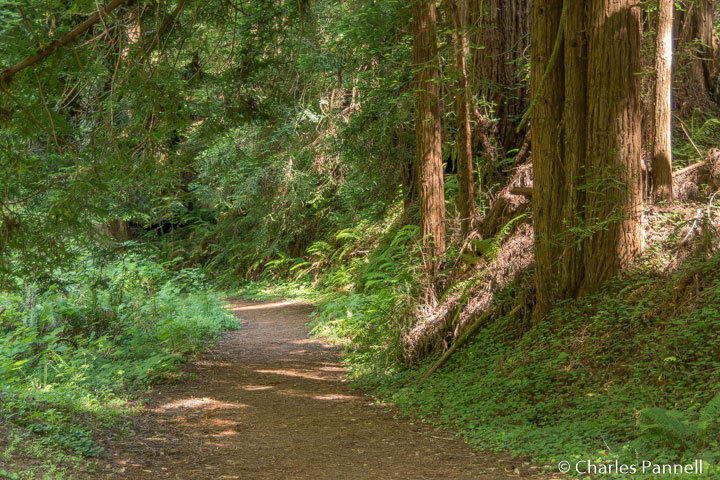 Redwood trees, ferns and other greenery line both sides of the trail, and the small waterfalls and churning rapids in the adjacent Russian Gulch River make this a very scenic hike. Add in the avian life in forest canopy and you have a real winner. The trail runs for 1.6 miles along the river to a small picnic area. Most wheelchair-users and slow walkers will only be able to do a half-mile of it though, as after that the trail gets progressively steeper, the cross slope becomes uneven, and ruts and other obstructions make it impassable. Still it’s a very pleasant half-mile, so enjoy the scenery and turn around when it gets too difficult. It should also be noted that the trail gets very muddy after storms, and the downed trees are not removed in the off season. On the other hand, if you visit on a sunny summer day, it’s a very cool, shaded and pleasant place to explore. You just can’t find a better romantic backdrop than the Northern California coast; and in that respect, remote Mendocino County tops the list. From the crashing waves along the rugged coastline, to the solitude of the coastal redwood forests, Mother Nature provides the perfect setting for a little romance. Add in a nice selection of small inns and intimate restaurants, and you have all the ingredients for the perfect romantic getaway.